At first, I bought this Crank Brothers multi-tool just to get the chain tool to replace the cheap one that I had just broken. I had another simpler multi-tool from Park, but I thought that it was always handy to leave a spare in the car or in the toolbox. It was not much more expensive than just getting a good chain tool anyway. What I got from the M17 was much more than I had anticipated. The chain tool works very well, and I sometimes use it instead of my dedicated chain tool when this one is closer by. It’s easy to get enough hold/leverage to push the chain pin out, and the chain tool’s screw/pin is made of strong material. If not using a quick-link, the tool drives the pin straight and holds the chain pretty well for a multi-tool. The M17 contains pretty much every bit needed to build a complete bike (8-6-5-4-3-2.5-2mm allen bits, T25 Torx, flat #2 and phillips #2 screwdriver bits, #0-1-2-3 spoke wrenches, and 8-10mm open wrench cutouts. People who have different Torx fasteners to hold their brake levers or else might need to carry another small L-shaped wrench, but I’ve never needed to. If a Torx T-10 is needed, the M19 from Crank Brothers has it and it’s not that much bulkier to carry so you might as well but the biggest model. I am someone who easily gets annoyed by rattling sounds of parts on my bike or tools in my backpack. With the nice little rubber strap that keeps everything together, this tool doesn’t have any rattling part and is protected from other things that could touch it. It makes for a well held-together and silent tool to carry, and that’s a good thing for those who carry it in their bike’s downtube or wattle bottle. I also use the little rubber piece to hold a quick link and a presta adapter. One could also tighten or loosen the two sides of the multi-tool for easier or harder-to-turn bits. The M series are cheaper than the Y series from Crank Brothers, and their F-series might be a bit smaller but they have sharper edges. The M17’s shape is really comfortable when using it, and it has less chances to break something in your pack if you crash on it. Durability-wise, you can tell by the pictures that after around 10 years of use, it still looks pretty good and works as well as a new one. Nothing ever came loose, the finish is durable (and well protected by the black rubber band), and the bits don’t seem to use. I have never seen rust on it, and it spent many summers in my backpack without rain protection. It’s backed with a lifetime warranty, but after already many years of good use, I don’t see myself needing the warranty at all. I seriously can’t see how there could be a better multi-tool ever. Five stars! This bad boy fits everything on all of my bikes:) trail, single speed, commuter, jump, and friends bikes! CrankBrothers make a few models with fewer and more tools, depending on what your needs are. Just a little extra weight to carry along. It has saved more than a handful of rides and that along makes it invaluable. Nothing is worse than finally getting out on the trail and few miles later you or one of your buddies is broke down and the fun stops and the sweating begins. It is almost like having a whole bike shop of tools right under the seat. I have this exact one other than my 17 has some ano-gold trim. The chain tool functions properly and you can get some good torque on it to pop those stubborn links and the spoke wrench works like a charm and isn't unmanageable considering the rest of the tool is connected. This little piece of trail wonderment has been well thought out and built with long lasting materials. All of the hex wrenches and drivers are still in good shape considering some of the ragged junk that they've fixed. It's a backcountry must. 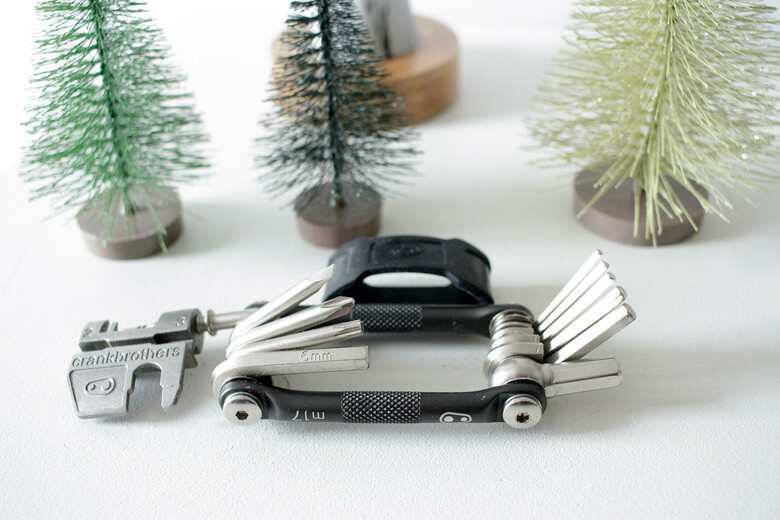 The multi tool 17 is a durable, versatile and well designed multitool. Equipped with a chain tool and spoke wrench, this crank brothers tool is ready for all day epics or local trail rides. Great product, I have been using it for years with no issues, perfect to slip in your pocket on a short ride or throw int he pack for longer rides. Has all the tools you would ever need. Slim and compact, reliable, contains all essential tools. Chain tool is uncomfortably small. Prone to rusting. 8mm hex key is not very useful. I've been using this tool for trail repairs and even occasional garage work for four years without any serious problems. It fits easily in a jersey pocket or saddlebag. It includes various sizes of hex keys, a T25 torx key, flat and Philips screwdrivers, a chain tool, and spoke wrenches.I haven't had a problem with any of the bits rounding.The hex keys are great, although the 8mm seems unnecessary because the tool is too short to provide the kind of leverage needed with most 8mm hex bolts. The flat screwdriver could probably be eliminated too. The chain tool is short, so it's difficult to grip, but it does work and has saved multiple rides from turning into hikes. The tool has picked up some spots of surface rust over the years, but it's still working just fine. I never go on a ride without it. The ultimate trailside companion - these high tensile steel multi-tools feature a precise fit and finish and side grips for a secure handhold even with gloves on.